Even Drying Promotes Straight, Flat Flooring. Because wood dries and shrinks first at the outside, the outer surfaces tend to be in tension while the inside is in compression. Keeping these forces balanced is crucial to keeping the wood flat and straight. That’s why even air­flow is so important during acclimation. One edge drying faster than the other can result in crooked wood, because that edge exerts more tension on the board. Similarly, one face drying faster than another can cup or bow the lumber. Twists result from a combination of forces. Similar effects can occur from uneven wetting of the lumber. We try to acclimate wide plank flooring to slightly higher than the midpoint. It’s better to allow the floor a little more tolerance for expansion because the risk of buckling always outweighs the possibility of having a small gap between the boards during the dry season. To speed up acclimation, remove flooring that’s less than 3 in. wide from its packaging and spread over a clean, dry subfloor covered with a vapor retarder. Because of its width, plank flooring is more susceptible to cupping than strip flooring. Stack boards wider than 3 in. in a pile with stickers (flat strips of wood at least % in. thick) between the boards to aid uniform air circulation. Weight the top of the pile to help keep the boards flat. To speed acclimation, use a humidifier or dehumidifier as appropriate. 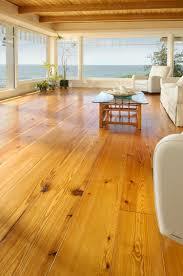 If acclimating your wood flooring sounds like a lot of trouble, consider this. The flooring industry suffers one billion dollars a year in losses associated with moisture problems. If you do not acclimate the flooring correctly, you are liable for all associated financial losses. I receive calls every week from contractors about floors that failed because they were installed under improper moisture conditions. It’s really quite simple to escape potential problems. The key point to keep in mind is to install the floor at the right moisture content for the environment. Sometimes, the wood comes at the correct moisture content and needs no acclimation. On the other hand, acclimation on some specialized commercial projects I’ve done took two months. It was time well spent.